Epidemiological studies suggest that low vitamin D levels may increase the risk or severity of respiratory viral infections. In this study, we examined the effect of vitamin D on respiratory syncytial virus (RSV)-infected human airway epithelial cells. Airway epithelium converts 25-hydroxyvitamin D3 (storage form) to 1,25-dihydroxyvitamin D3 (active form). Active vitamin D, generated locally in tissues, is important for the nonskeletal actions of vitamin D, including its effects on immune responses. We found that vitamin D induces IκBα, an NF-κB inhibitor, in airway epithelium and decreases RSV induction of NF-κB–driven genes such as IFN-β and CXCL10. We also found that exposing airway epithelial cells to vitamin D reduced induction of IFN-stimulated proteins with important antiviral activity (e.g., myxovirus resistance A and IFN-stimulated protein of 15 kDa). In contrast to RSV-induced gene expression, vitamin D had no effect on IFN signaling, and isolated IFN induced gene expression. Inhibiting NF-κB with an adenovirus vector that expressed a nondegradable form of IκBα mimicked the effects of vitamin D. When the vitamin D receptor was silenced with small interfering RNA, the vitamin D effects were abolished. Most importantly we found that, despite inducing IκBα and dampening chemokines and IFN-β, there was no increase in viral mRNA or protein or in viral replication. We conclude that vitamin D decreases the inflammatory response to viral infections in airway epithelium without jeopardizing viral clearance. This suggests that adequate vitamin D levels would contribute to reduced inflammation and less severe disease in RSV-infected individuals. Vitamin D is increasingly recognized as a pluripotent hormone with functions that extend beyond its classical role in calcium homeostasis (1). Rapidly growing evidence from epidemiological and basic research studies reveals that vitamin D can modulate immune responses (2–4). Vitamin D deficiency is highly prevalent and has been associated with both increased risk of several inflammatory diseases (5–9) and susceptibility to infections, including viral respiratory infections (10, 11). The localized tissue-specific generation of active vitamin D is thought to be a key component of nonclassical vitamin D functions. In our previously published data, we showed that normal lung epithelium constitutively converts 25-hydroxyvitamin D3 (storage form of vitamin D) to 1,25-dihydroxyvitamin D3 (1,25D) (active form of vitamin D) and that the generation of active vitamin D is increased in the presence of viral infection (12). The airway epithelium is the first line of defense during respiratory virus infection (13). Respiratory epithelium expresses TLR and retinoic acid-inducible gene I-like receptors that sense viral RNA. Ligand engagement results in the activation of both NF-κB and IFN regulatory factors (IRFs) (14–16). The end result is amplification of host defense to microorganisms through secretion of antimicrobial peptides, chemokines and cytokines, and, in particular, type I IFNs (13, 17). We have shown that vitamin D increases the levels of TLR, coreceptor CD 14, and the antimicrobial peptide cathelicidin in airway epithelium (12). Type I IFNs play a crucial role in defense against viruses. They mediate antiviral activity by triggering the expression of >100 IFN-stimulated genes (ISGs), the products of which have diverse antiviral activities (18, 19). Chemokines are a family of small molecules that induce chemotaxis of neutrophils, mononuclear cells, or lymphocytes. Chemokines can also stimulate leukocyte degranulation or release of inflammatory mediators (20). Chemokines thus play a pivotal role in orchestrating inflammation and have been found to be produced by an array of cells, including epithelial cells (21). Production of chemokines can be either beneficial or detrimental to the host. Inflammation is an essential component of host defense; however, a too vigorous response against microbes or inflammation may be deleterious to the host, leading to impaired organ function. Vitamin D has been shown to inhibit production of inflammatory chemokines in animal models of inflammatory diseases such as multiple sclerosis and type 1 diabetes (22–24). The family of NF-κB transcriptional regulatory factors has a central role in coordinating the expression of a wide variety of genes that control immune responses. NF-κB proteins are present in the cytoplasm in association with IκBs. IκBs are phosphorylated by IκB kinase following cell stimulation, and they are targeted for destruction by the ubiquitin/proteasome degradation pathway (25). The degradation of IκB allows NF-κB proteins to translocate to the nucleus, bind to their DNA binding sites (26), and activate a variety of genes, including cytokines and chemokines (27). Studies in various cell types, including dendritic cells (28–30), fibroblasts (31, 32), keratinocytes (33), pancreatic islet cells (23), and kidney cells (34) indicate that vitamin D dampens NF-κB signaling. Several mechanisms have been proposed, including a vitamin D-induced increase in levels of IκBα (23, 32, 33), interference with the binding of NF-κB subunits to promoter regulatory areas (30, 31, 34), or both. Epidemiological studies suggest that low vitamin D levels are a risk factor for viral respiratory infections. However, vitamin D has been found to inhibit NF-κB signaling, which could result in decreased viral clearance, lessened inflammatory responses via inhibition of type I IFN signaling and chemokines, or both. The present study was undertaken to look at the effects of vitamin D on NF-κB signaling, especially as it relates to antiviral immunity in airway epithelium. 1,25D was obtained from Calbiochem (San Diego, CA). Lactacystin was obtained from Sigma-Aldrich (St. Louis, MO). IFN-β was purchased from PBL Interferon Source (Piscataway, NJ). Human tracheobronchial epithelial (hTBE) cells were obtained from the University of Iowa Cell and Tissue Core under a protocol approved by the University of Iowa Institutional Review Board. Epithelial cells were isolated from tracheal and bronchial mucosa by enzymatic dissociation and cultured in Laboratory of Human Carcinogenesis 8e medium on plates coated with collagen for study up to passage 10 as described previously (35). All of the experiments were conducted using cells from at least three different donors. Cells at 80% confluency were infected with human respiratory syncytial virus (RSV), strain A-2 (multiplicity of infection [MOI] 1–2). Viral stocks were obtained from Advanced Biotechnologies (Columbia, MD). The initial stock (3 × 108 PFU per milliliter) was placed in aliquots and kept frozen at −135°F. The virus was never refrozen. GFP-RSV was a kind gift from Dr. Steve Varga (University of Iowa, Iowa City, IA). Total RNA was isolated using the RNAqueous-4PCR Kit (Ambion, Austin, TX) following the manufacturer’s instructions. RNA quality and quantity were assessed with an Experion Automated Electrophoresis System (Bio-Rad, Hercules, CA) using the Experion RNA StdSens Analysis Kit according to the manufacturer’s protocol. RNA quality was considered adequate for use if the 28S/18S ratio was >1.2, and the RNA quality indicator was >7. Total RNA (300 ng) was reverse-transcribed to cDNA using the iScript cDNA Synthesis Kit (Bio-Rad) following the manufacturer’s instructions. PCR reactions were performed using 2 μl cDNA and 48 μl master mix, containing iQ SYBR Green Supermix (Bio-Rad), 15 pmol of forward primer, and 15 pmol of reverse primer, in a CFX96 Real-Time PCR Detection System (Bio-Rad) as follows: 3 min at 95°C followed by 40 cycles of 10 s at 95°C and 30 s at 55°C and plate read. The fluorescence signal generated with SYBR Green I DNA dye was measured during annealing steps. Specificity of the amplification was confirmed using a melting curve analysis. Data were collected and recorded by CFX Manager Software (Bio-Rad) and expressed as a function of threshold cycle (CT). The relative quantity of the gene of interest was then normalized to the relative quantity of hypoxanthine phosphoribosyltransferase (ΔΔCT). The sample mRNA abundance was calculated by the equation 2−(ΔΔCT). CXCL10 GTCTGAATCCAGAATCGAAGGC (forward), TTGAGGGTTTGCTACAACATGGGC (reverse); HPRT GCAGACTTTGCTTTCCTTGG (forward), AAGCAGATGGCCACAGAACT (reverse); IFN-β TGGGAGGCTTGAATACTGCCTCAA (forward), TCCTTGGCCTTCAGGTAATGCAGA (reverse); IκBα AACCTGCAGCAGACTCCACT (forward), TCCTGAGCATTGACATCAGC (reverse); ISG15 CTGAGAGGCAGCGAACTCATCTTT (forward), AATCTTCTGGGTGATCTGCGCCTT (reverse); myxovirus resistance A (MXA) GAAGCCCTGCAGAGAGAGAA (forward), AACTCGTGTCGGAGTCTGGT (reverse); RSV N gene CAAGCCCAAAGCTGTGCTAAACCA (forward), AGACAGTGACTATGCGGTCTGCAA (reverse). Gene-specific primers were custom-synthesized and purchased from Integrated DNA Technologies (Iowa City, IA) based on design using gene-specific nucleotide sequences from the National Center for Biotechnology Information sequence databases and the PrimerQuest Web interface (Integrated DNA Technologies). Whole-cell protein extracts were prepared by lysis of cell monolayers in 200 μl of lysis buffer (50 mM Tris [pH 7.4], 150 mM NaCl, and 1% Nonidet P-40), a protease inhibitor mixture (Roche Applied Science, Indianapolis, IN), and a phosphatase inhibitor mixture (no. 524625; Calbiochem). The lysates were sonicated for 20 s and kept at 4°C for 30 min. After 5 min of centrifugation (14,000 rpm at 4°C), the supernatant was saved as a whole-cell lysate. Cytosolic and nuclear protein extracts were prepared by lysis of cells in 400 μl of lysis buffer (10 mM HEPES [pH 7.8], 10 mM KCl, 2 mM MgCl2, and 0.1 mM EDTA). The lysates were incubated on ice for 15 min, 25 μl 10% Nonidet P-40 was added, and vigorous mixing ensued. After 30 s centrifugation (14,000 rpm at 4°C), the supernatant was saved as the cytosolic fraction. The pelleted nuclei were resuspended in 50 μl of extraction buffer (50 mM HEPES [pH 7.8], 50 mM KCl, 300 mM NaCl, 0.1 mM EDTA, and 10% glycerol) and incubated on ice for 20 min. After a 5 min centrifugation (14,000 rpm at 4°C), the supernatant was saved as nuclear fraction. Protein determinations were made using a protein measurement kit (Bradford protein assay, no. 500-0006) from Bio-Rad. Extracts were stored at −70°C. Primary Abs were obtained from the following: IκBα (no. 203; Santa Cruz Biotechnology, Santa Cruz, CA), HDAC2 (no. 7899; Santa Cruz Biotechnology), IFN-stimulated protein of 15 kDa (ISG15) (no. 4845; R&D Systems, Minneapolis, MN), MXA (no. CH-4302; BacLab, Muttenz, Switzerland), p65 (no. 109; Santa Cruz Biotechnology), total STAT1 (no. 346; Santa Cruz Biotechnology), phospho-STAT1-Tyr701 (no. 9171; Cell Signaling Technology, Beverly, MA), phospho-STAT1-Ser727 (no. 9177; Cell Signaling Technology), RSV all Ags (no. B65860G; Biodesign International, Saco ME), vitamin D receptor (VDR) (no. 13133; Santa Cruz Biotechnology), and IRF-3 (no. 4962; Cell Signaling Technology). Protein (25–30 μg of whole cell or 8–15 μg nuclear) was mixed 1:1 with 2× sample buffer (20% glycerol, 4% SDS, 10% 2-ME, 0.05% bromophenol blue, and 1.25 M Tris [pH 6.8]), loaded onto a 12 or 15% (ISG15) SDS-PAGE gel, and run at 150 V for 90 min. Cell proteins were transferred to an Immuno-Blot polyvinylidene difluoride membrane (Bio-Rad) with a Bio-Rad semidry transfer system according to the manufacturer’s instructions. The polyvinylidene difluoride membrane was then incubated with primary Ab (dilutions 1:500–1:1000) in 5% milk in Tris-buffered saline with 0.1% Tween 20 overnight. The blots were washed three times with Tris-buffered saline with 0.1% Tween 20 and incubated for 1 h with HRP-conjugated secondary anti-IgG Ab (dilution 1:2000–1:20,000). The blots were washed again three times with Tris-buffered saline with 0.1% Tween 20, and immunoreactive bands were developed using the chemiluminescent substrate ECL Plus (Amersham Biosciences, Piscataway, NJ). An autoradiograph was obtained with exposure times of 10 s to 2 min. Equal loading of proteins was confirmed with β-actin (no. 8226; Abcam, Cambridge, MA) (primary Ab dilution 1:20,000 and secondary Ab dilution 1:40,000). Supernatants were collected and frozen at −70°C. CXCL10 concentrations were determined using DuoSet ELISA Kits from R&D Systems (no. DY266) following the manufacturer’s protocol. Control small interfering RNA (siRNA) (no. 44230; Santa Cruz Biotechnology) or target-specific 19–25 nt siRNA designed to knock down VDR gene expression (no. 106692; Santa Cruz Biotechnology) was transfected into hTBE cells at a final concentration of 50 nM using Lipofectamine 2000 (Invitrogen, Carlsbad, CA). Transfection mixtures were as previously described (36). Cells were incubated with 200 μl of transfection mixture and 2 ml of antibiotic-free medium for 16–18 h. Transfection efficiency was assessed with a fluorescent control siRNA (no. 36869; Santa Cruz Biotechnology). Knockdown of VDR was confirmed by quantitative real-time PCR (QRT-PCR) and Western blot analysis. Inhibition of NF-κB‑dependent signaling was accomplished by infecting hTBE cells with a recombinant adenoviral vector (MOI 10) that expresses a dominant-negative mutant form (nondegradable) of IκBα or the control vector BglII, as previously described (37). An adenovirus vector expressing GFP was used to assess the level of epithelial cell transgene expression. When two groups were compared, we used a two-tailed Student t test. To compare three or more groups, we used repeated measures ANOVA followed by Bonferroni’s method to control for multiple comparisons. When treatments were being compared with a control but not each other, Dunnett’s test was used to correct for multiple comparisons. Data are presented as mean ± SEM. p values of <0.05 were considered statistically significant. These methods were performed using GraphPad Prism 5 for Windows (GraphPad, San Diego, CA). To determine the effects of vitamin D on NF-κB signaling, we examined the effect of vitamin D on the NF-κB inhibitory protein IκBα. In other systems, vitamin D increases the expression of IκBα; therefore, we hypothesized that this was also true for airway epithelium (23, 32, 33). To test this hypothesis, hTBE cells were treated with 1,25D for 24 h, and the level of IκBα mRNA was evaluated by QRT-PCR. Treatment with vitamin D led to a statistically significant increase in the level of IκBα mRNA (Fig. 1A). There was no change in mRNA half-life, suggesting an effect of vitamin D on transcription (data not shown). Vitamin D increases expression of the NF-κB inhibitory protein IκBα. A, hTBE cells were treated with 10−7 M 1,25D for 36 h, and levels of IκBα mRNA were measured by QRT-PCR. Vitamin D increases levels of IκBα mRNA. B, hTBE cells pretreated with increasing doses of 1,25D (M) for 16–18 h and then infected with RSV (MOI 1–2) for 24 h. Vitamin D increases IκBα protein in a dose-dependent manner. Less IκBα protein is seen in RSV-infected cells compared with noninfected cells. C, hTBE cells pretreated with 10−7 M 1,25D followed by infection with RSV (MOI 1–2) for 24 h. The proteasome inhibitor lactacystin (10 μM) was added for the last 3 h of the experiment. 1,25D increased both total and phosphorylated IκBα, suggesting that induction of IκBα by 1,25D is due to increased production of IκBα rather than inhibition of its degradation. Paired Student t test. *p < 0.05 when compared with control. We proceeded to look at IκBα protein levels and found that vitamin D increases the levels of IκBα protein in a dose-dependent manner. When we evaluated a viral model, cells infected with RSV for 24 h had decreased IκBα protein levels consistent with RSV-induced degradation of IκBα. When cells were pretreated with increasing doses of 1,25D, prior to infection with RSV, we saw a dose-dependent increase in IκBα levels in RSV-infected and noninfected cells (Fig. 1B). To investigate whether the increase in protein levels was due to changes in IκBα phosphorylation and degradation, we pretreated airway epithelial cells with 1,25D and infected them with RSV for 24 h with and without the proteasome inhibitor (lactacystin) for the last 3 h of the experiment. We found that, in the presence of a proteasome inhibitor, 1,25D increased both total and phosphorylated IκBα in the presence and absence of RSV infection (Fig. 1C). These data, combined, indicate that in airway epithelium vitamin D increases levels of IκBα, a well established inhibitor of NF-κB signaling, by increasing levels of mRNA transcription and protein synthesis. The proteasome inhibitor data suggest that the increase in IκBα with vitamin D exposure is due to increased production and not increased stability. Infected airway epithelium utilizes TLRs and the RNA helicase retinoic acid-inducible gene I, to detect and respond to RSV infection (38–42). Activation of those signaling pathways leads to activation of the transcription factors NF-κB and IRFs (43). Following RSV infection, NF-κB translocates into the nucleus and turns on target genes including IFN-β (type I IFN) and several chemokines that are essential for host defense against viral infection (44, 45). Having established that vitamin D inhibits NF-κB signaling in airway epithelium, we next asked whether 1,25D limits expression of host defense molecules driven by NF-κB. First, we wanted to establish at which time point RSV-induced gene expression was at maximum. hTBE cells were treated with RSV (MOI 1–2) for 3, 6, 16, or 24 h, and expression of IFN-β, STAT1, ISGs, and chemokines were examined (Fig. 2A). This revealed significant induction at 16 h with a maximum at 24 h. We then went on to evaluate the effects of vitamin D on virally induced genes at 24 h. IFN-β is essential to host response against viral infections (46). The gene coding for IFN-β has an NF-κB site in its promoter, which, along with ATF-2/c-jun and IRF-3/IRF-7 sites, compose the enhanceosome, required for transcriptional activation of the IFN-β gene. In turn, IFN-β activates STAT1 and STAT2. hTBE cells were pretreated with 1,25D followed by 24 h of infection with RSV (MOI 1–2). Levels of IFN-β mRNA and STAT1 activation were measured by QRT-PCR and Western blot analysis, respectively. Treatment with 1,25D resulted in significant reductions of levels of IFN-β mRNA and of IFN-β–induced STAT1 protein and STAT1 translocation to the nucleus (Fig. 2B). Activation of STAT1 and STAT2 leads to the formation of the transcription complex ISG factor 3. ISG factor 3 binds to IFN-stimulated response elements (ISREs) in ISGs and induces their expression. Vitamin D decreases RSV induction of IFN-β and ISGs. A, hTBE cells were infected with RSV for 3, 6, 16, and 24 h. Induction of IFN-β, ISGs, and chemokines was evaluated using QRT-PCR, ELISA, and Western blot analysis. Maximum induction was observed at 24 h. B, hTBE cells were pretreated with 10−7 M 1,25D for 16–18 h and then infected with RSV (MOI 1–2) for 24 h. INF-β mRNA was quantified by QRT-PCR. Total STAT1, phosphorylated STAT1 at Tyr701 and Ser927, and nuclear STAT1 were observed by Western blot analysis. Vitamin D decreased RSV-induced levels of IFN-β mRNA and RSV induction of STAT1 and its nuclear translocation. C, hTBE cells were pretreated with vitamin D and infected with RSV as in B. CXCL10, MxA, and ISG15 mRNA were evaluated by QRT-PCR. CXCL10 protein was measured by ELISA, and MxA and ISG15 protein were measured by Western blot. Vitamin D decreased RSV induction of the chemokine CXCL10 and, to a lesser extent, the antiviral effectors MxA and ISG15. ANOVA with Dunnett’s test for comparisons with control (A) and Bonferroni’s test for multiple comparisons (B and C). **p < 0.01; ***p < 0.001 when compared with control. We next determined the role of vitamin D in expression of ISGs with and without known NF-κB sites in their promoters. CXCL10 (IP-10) is a chemokine that is induced by RSV infection (44, 47, 48) and has both ISRE and NF-κB sites in its promoter (49). MXA and ISG15, however, are ISGs that directly inhibit viral production (50) and have ISRE sites in their promoters but not functional NF-κB sites (51–53). As previously, we pretreated hTBE cells with 1,25D, followed by RSV infection, and looked at gene transcription and protein levels. Treatment with 1,25D resulted in decreased levels of both chemokines and antiviral effectors (Fig. 2C). The suppression in transcription was more pronounced for CXCL10 (ISRE and NF-κB sites), with an 86% reduction in the level of CXCL10 mRNA, than those in the antiviral effectors (ISRE site only), where a 56% reduction in the level of MxA mRNA and a 62% reduction in the level of ISG15 were observed (Fig. 2C). These data indicate that 1,25D does modulate IFN-β and ISGs in airway epithelium infected with RSV. These findings raise the question: is vitamin D directly inhibiting both NF-κB and STAT signaling or is it alternatively having a direct effect on only NF-κB with subsequent suppression of NF-κB‑driven IFN production and STAT activation? We proceeded to determine whether vitamin D could be effecting not only activation of NF-κB but also activation of IRF-3. Recognition of viral RNA by either retinoic acid-inducible gene I-like receptors or TLR results in activation of both NF-κB and IRF-3. If the effects of vitamin D were at the level of dsRNA sensing, then one would expect the expression of both transcription factors to be decreased. IRF-3 is a latent transcription factor that is activated by phosphorylation by kinases that are activated in response to viral dsRNA (54). This results in the formation of IRF-3 dimers that translocate to the nucleus and bind to promoter areas. IRF-3 activation has been shown to be rapid (<6 h) in RSV infection (38). To investigate whether the vitamin D effects could be explained by effects on IRF-3, we looked at the translocation of IRF-3 to the nucleus. hTBE cells were infected with RSV (MOI 1–2) for 1, 3, or 8 h in the presence or absence of vitamin D. Nuclear translocation of IRF-3 was evaluated by Western blot analysis (Fig. 3A). Vitamin D did not suppress IRF-3 translocation to the nucleus but, on the contrary, may have even increased it. Effects of vitamin D occur at the level of NF-κB. A, hTBE cells infected with RSV (MOI 1–2) for 1, 3, or 8 h in the presence or absence of pretreatment with 10−7 M 1,25D. Western blot analysis for nuclear and cytosolic IRF-3. Vitamin D does not decrease nuclear localization of IRF-3. B, hTBE cells pretreated with 10−7 M 1,25D for 16–18 h and then stimulated with IFN-β (1000 U) or infected with RSV (MOI 1–2) for 24 h. STAT1 induction was evaluated by Western blot analysis. Vitamin D does not affect IFN-β–induced STAT1. C, hTBE cells were treated as in B, and expression of MxA and ISG15 mRNA and protein were evaluated by QRT-PCR and Western blot analysis, respectively. Vitamin D did not influence IFN-β–induced MxA or ISG15. Activation of NF-κB leads to the induction of IFN-β. The most likely explanation of our data is that suppression of NF-κB by vitamin D leads to the production of less IFN-β, which is dependent on this transcription factor for its expression. However, if the effects of vitamin D were downstream of IFN-β, then one would expect vitamin D to have the same effects on STAT1 and ISGs induction as IFN-β itself and RSV. To determine this, hTBE cells were treated with IFN-β (1000 U) or RSV (MOI 1–2) for 24 h in the presence or absence of vitamin D. As expected, both IFN-β and RSV increased expression and activation of STAT1. In contrast to RSV-induced STAT1, vitamin D had no effects on IFN-β–induced STAT1 (Fig. 3B). 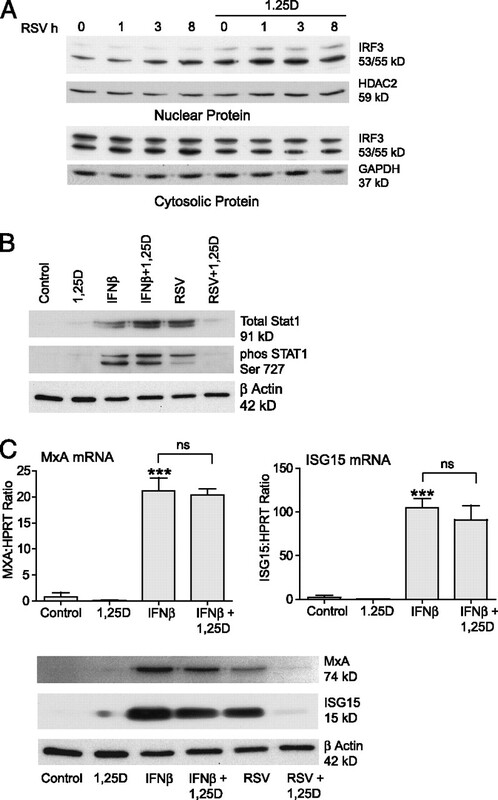 Furthermore, unlike RSV-induced antiviral effectors, vitamin D had no effects on IFN-β–induced MxA or ISG15 (Fig. 3C). This suggests that vitamin D does not affect IFN signaling downstream of IFN-β. These results, combined, suggest that the effects of vitamin D are occurring at the level of NF-κB. To further support our hypothesis that 1,25D is modulating airway epithelial response to viral infection by inhibiting NF-κB, we introduced a recombinant adenoviral vector expressing a dominant-negative mutant form (nondegradable) of IκBα (55). We hypothesized that inhibiting NF-κB with the adenovirus vector would mimic the effects of 1,25D. First, we assessed the level of epithelial cell transgene expression, by using an adenovirus vector expressing GFP, and found that ∼80% of the cells expressed the vector (Fig. 4A). hTBE cells were subsequently infected with an adenovirus containing the nondegradable IκBα (AdIκBα S32/36) or an empty vector BglII (AdBglll). Briefly, hTBE cells were incubated with adenovirus vector (MOI 10) for 2 h followed by change of media. Cells were infected with RSV (MOI 1–2) 24 h later. We found that inhibiting NF-κB with the AdIκBα mutant resulted in a significant decrease in RSV induction of IFN-β and CXCL10 with a less prominent decrease in MxA and ISG15 (Fig. 4B). As expected, the AdIκBα vector did not affect the expression of MxA or ISG15 when induced by IFN-β (Fig. 4C). These data show that 1,25D has the same effects on IFN-β and IFN-driven genes during RSV infection as overexpression of the NF-κB inhibitor IκBα. Overexpressing IκBα mimics vitamin D effects. A, hTBE cells were infected with GFP-labeled adenovirus vector (MOI 10) for 24 h, and transgene expression was assessed by fluorescent microscopy. Approximately 80% of the cells were found to express the GFP-labeled adenovirus vector. B and C, hTBE cells were infected with either empty adenovirus vector or an adenovirus vector overexpressing IκBα (MOI 10) for 24 h and then infected with RSV (MOI 1–2) or stimulated with IFN-β (1000 U) for 24 h. IFN-β, CXCL10, MxA, and ISG15 mRNA were quantified by QRT-PCR. 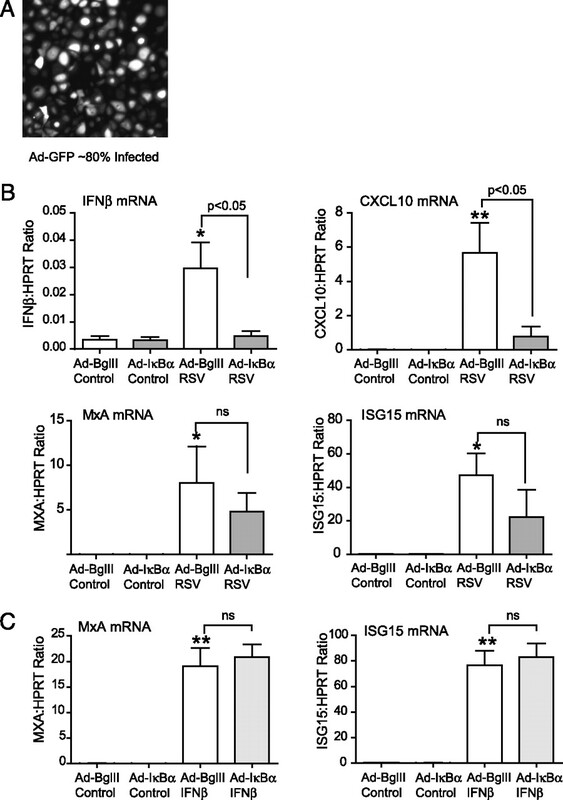 Like 1,25D, the AdIκBα vector significantly reduced RSV induction of IFN-β and CXCL10. There was a trend toward a decrease in the RSV-induced antiviral effectors, MxA and ISG15, which did not reach statistical significance. Like vitamin D, the AdIκBα vector had no effects on IFN-β–induced MxA and ISG15. ANOVA with Bonferroni’s test for multiple comparisons. *p < 0.05; **p < 0.01 when compared with control. The biological effects of vitamin D are achieved through regulation of gene expression mediated by the VDR (56). VDR is a transcription factor, and it dimerizes with the retinoic X receptor upon ligand binding (57). This complex binds to vitamin D-responsive elements within the promoter regions of vitamin D-responsive genes (58). To confirm that our findings are directly due to 1,25D, we next explored whether silencing the VDR would reverse the vitamin D effects. hTBE cells were transfected with control siRNA or VDR siRNA. Transfection efficiency was tested using fluorescent control siRNA. Fluorescent microscopy indicated >90% transfection efficiency (data not shown). Knockdown of the VDR was confirmed by Western blot analysis (Fig. 5A). hTBE cells were pretreated with 1,25D followed by infection with RSV (MOI 1–2) for 24 h. Expression of IFN-β and ISGs was evaluated. When cells were transfected with control siRNA, vitamin D reduced RSV-induced expression of IFN-β, chemokines, and antiviral effectors, as shown previously in nontransfected cells. When VDR expression was silenced, vitamin D no longer had immunomodulatory effects (Fig. 5B). These data, combined, further support that vitamin D modulates the inflammatory response to RSV by dampening induction of IFN-β and ISGs. Silencing the VDR abolishes the effects of vitamin D on RSV-induced IFN-β, chemokines, and ISGs. A, hTBE cells were transfected with control siRNA or VDR siRNA for 16 or 24 h, and VDR protein was evaluated by Western blot analysis. The VDR siRNA successfully knocked down the VDR. B, hTBE cells were transfected with control siRNA or VDR siRNA for 24 h, pretreated with 1,25D for 16–18 h, and then infected with RSV (MOI 1–2) for 24 h. IFN-β, CXCL10, MxA, and ISG15 mRNA were evaluated by QRT-PCR, CXCL10 protein was evaluated by ELISA, and ISG15 protein was evaluated by Western blot analysis. Vitamin D reduced the expression of IFN-β, CXCL10, MxA, and ISG15 in cells transfected with control siRNA but had no effects in cells transfected with VDR siRNA. ANOVA with Bonferroni’s test for multiple comparisons. *p < 0.05; **p < 0.01 when compared with control. IFN-β and IFN-driven genes are central in host defense against viral infection. On the basis of our findings, vitamin D decreases expression of IFN-β and IFN-driven genes by increasing levels of IκBα and, thus, inhibits the canonical NF-κB pathway. This raises the concern that viral replication may be increased in the presence of 1,25D. Consequently, we infected hTBE cells with RSV in the presence or absence of 1,25D and looked at markers of viral quantity and replication. Expression of viral mRNA (N gene) was measured by real-time PCR. 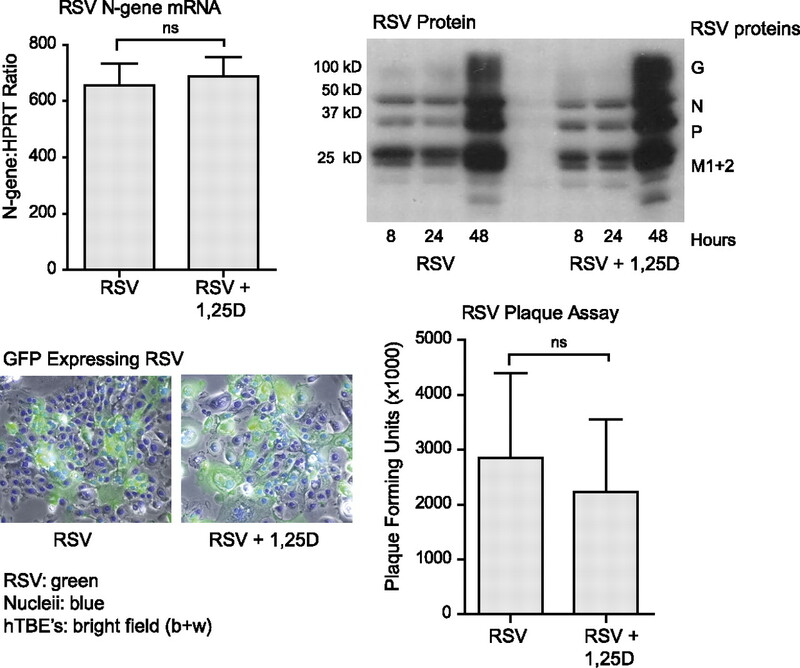 RSV viral proteins were quantified by Western blot analysis (anti-RSV, all Ag). Viral titers were measured by standard plaque assays, as previously described (59). Last, cells were infected with GFP-labeled RSV, fixed with formalin, and viewed with a light and fluorescent microscope. All four modalities suggest that vitamin D does not alter viral replication (Fig. 6). These data show that despite inhibition of IFN-β and ISGs viral replication is not increased in the presence of 1,25D. Vitamin D does not jeopardize viral clearance. hTBE cells were infected with RSV (MOI 1–2) with or without pretreatment with 10−7 M 1,25D for 16–18 h. Viral quantity and viral replication were analyzed by RT-PCR, Western blot analysis, light microscopy of GFP-tagged RSV (blue, DAPI nuclear stain), and plaque assay. Vitamin D had no effects on the quantity or replication of RSV. Unpaired Student t test. We have shown that vitamin D modulates NF-κB signaling in primary airway epithelial cells. 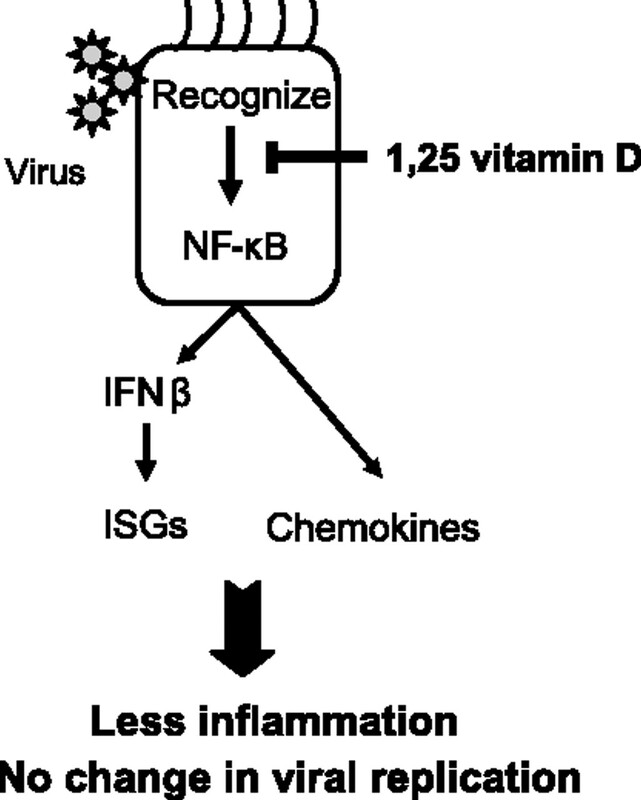 Furthermore, we have found that even though vitamin D dampens the expression of both chemokines and IFN-driven genes, whose role is to limit the spread of a virus, viral load is not increased in the presence of vitamin D. This indicates that vitamin D may dampen the inflammatory response to viruses without negatively affecting viral replication (Fig. 7). Vitamin D decreases RSV induction of NF-κB–linked chemokines and cytokines in airway epithelium while maintaining the antiviral state. Respiratory epithelium recognizes viruses via pattern recognition receptors. Ligand engagement results in activation of NF-κB and NF-κB–linked genes, including IFN-β and chemokines. Vitamin D modulates the airway epithelial responses to RSV by inhibiting NF-κB signaling. Despite dampening the innate antiviral response, vitamin D does not jeopardize viral clearance. Airway epithelium serves as the first line host defense system against respiratory viral infection. In addition to forming a mechanical barrier, the airway epithelium detects viruses (via pattern recognition receptors) and initiates the host immunological response. Stimulation of NF-κB–dependent gene transcription is a central aspect of inflammatory activation by pattern recognition receptors (60). The NF-κB pathway in airway epithelial cells is critical for generation of lung inflammation in response to local or systemic stimuli (61). The epithelial response to viral infections includes the production and secretion of chemokines, type I IFNs (IFN-β), and liberation of antimicrobial peptides (17, 62, 63). Several epidemiological studies have found an association between low vitamin D levels and respiratory infections (10, 11). It is well established that vitamin D modulates both innate and adaptive immune responses (3, 64). Vitamin D has been found to induce the antimicrobial peptide cathelicidin in several cell types, including airway epithelium (12, 65, 66). Animal studies suggest that vitamin D may dampen the production of chemokines. In a mouse model of multiple sclerosis, vitamin D was found to reverse experimental autoimmune encephalitis by inhibiting the synthesis of chemokines (22). Similar effects were found by two different groups using a mouse model for diabetes. Nonobese diabetic mice treated with vitamin D were found to have a decrease in pancreatic islet chemokine expression, which was accompanied by less insulitis and inhibition of type 1 diabetes development (23, 24). To our knowledge, this study is the first study to look at the effects of vitamin D on host defense against viral infection. Vitamin D has been found to regulate NF-κB activity by increasing IκBα levels, decreasing DNA binding of NF-κB in keratinocytes, fibroblasts, macrophages, and kidney cells, or both (32–34, 67, 68). Furthermore, two studies, using mouse models have linked NF-κB inhibition by vitamin D analogues with downregulation of chemokines and inhibition of inflammation. Using a mouse model of type 1 diabetes, Giarratana et al. (23) found that a vitamin D analogue upregulated IκBα and decreased in vivo and in vitro proinflammatory chemokine production by pancreatic islet cells. This resulted in the inhibition of T cell recruitment into pancreatic islets and type 1 diabetes development. In a mouse model of obstructive nephropathy, Tan et al. (69) showed that paricalcitol, a vitamin D analogue, reduced expression of chemokines and inhibited inflammatory cell infiltration in the obstructed kidney via VDR-mediated sequestration of NF-κB signaling. Our study is the first study to investigate the effects of vitamin D on NF-κB signaling in airway epithelium. The airway epithelium is the major site of RSV infection and plays an important role in initiating antiviral and inflammatory response against the virus. Although a number of cell types secrete chemokines in inflamed tissue, a body of evidence supports a central role for the airway epithelium as an important initiator and modifier of pulmonary inflammation (44, 70). This is particularly true for RSV because the virus productively replicates only in the respiratory mucosa. Studies have shown that RSV is among the most potent biologic stimuli to induce chemokine production by respiratory epithelial cells, a process that is largely controlled by the activation of NF-κB (71–75). Chemokines can be beneficial or detrimental to the host. Recruitment and activation of inflammatory cells are essential components of host defense; however, too vigorous response against microbes may be deleterious, leading to impaired organ function and potential mortality. Inflammatory chemokines have indeed been implicated as a contributor to the pathogenesis and severity of RSV infection (76–79). Therefore, modulating RSV-induced chemokines may have the potential to prevent excessive inflammation. Attempts to find effective anti-inflammatory therapies for this condition have been largely unsuccessful thus far. Several clinical trials have looked at using corticosteroids, but the results have not been consistent (80). Haeberle et al. (75) treated RSV-infected mice with perflubron (inserting it into the lungs) and found that a reduction in lung inflammation is associated with the inhibition of chemokine expression and NF-κB. Vitamin D provides a novel treatment option that may reduce lung inflammation and disease severity in RSV infection. If vitamin D suppresses IFN-β induction and, subsequently, IFN-driven genes that have diverse antiviral activities, then how is the antiviral state maintained? One possibility is that the suppression of IFN-β and its products is insignificant and sufficient amounts of antiviral effectors remain to successfully limit viral replication and spread. Another possibility is that the induction of antimicrobial peptides, with antiviral activity, by vitamin D counteracts the reduction in IFN-driven antiviral genes. We have shown that vitamin D induces cathelicidin in airway epithelium (12). Others have found that vitamin D increases levels of β-defensin-2 (66), which was recently found to have antiviral activity against RSV (81). Here, we show in an in vitro model of primary human airway epithelial cells that even though 1,25D decreases viral (RSV) induction of chemokines and IFN-β, and subsequently IFN-driven genes, there is no increase in viral replication. Controlling the inflammatory response to RSV viral infection, while maintaining antiviral activity, may result in decreased disease severity and consequently in decreased morbidity and mortality from this common infection. Vitamin D is safe, cheap, and easily available and could prove to be an effective therapeutic strategy; however, clinical studies are needed. We thank the cell and culture core at the University of Iowa for providing us with primary human airway epithelial cells. We thank Dr. Steve Varga for providing the GFP-labeled RSV and Dr. Dwight Look for providing us with the MxA Ab. This work was supported by National Institutes of Health Grants KL2 RR024980, R01 HL079901, R01 HL077431, R01 HL073967, and T32 HL007638 and a Veterans Administration Merit Review grant. 2007. Vitamin D deficiency. N. Engl. J. Med. 357: 266–281.
. 2008. Unexpected actions of vitamin D: new perspectives on the regulation of innate and adaptive immunity. Nat. Clin. Pract. Endocrinol. Metab. 4: 80‑90.
. 2008. Vitamin effects on the immune system: vitamins A and D take centre stage. Nat. Rev. Immunol. 8: 685–698. 2008. Vitamin D signaling, infectious diseases, and regulation of innate immunity. Infect. Immun. 76: 3837–3843.
. 2008. Variation in associations between allelic variants of the vitamin D receptor gene and onset of type 1 diabetes mellitus by ambient winter ultraviolet radiation levels: a meta-regression analysis. Am. J. Epidemiol. 168: 358–365.
. 2007. Is vitamin D deficiency to blame for the asthma epidemic? J. Allergy Clin. Immunol. 120: 1031–1035.
. 1996. Incidence of inflammatory bowel disease across Europe: is there a difference between north and south? Results of the European Collaborative Study on Inflammatory Bowel Disease (EC-IBD). Gut 39: 690–697.
. 1991. Geographic variation of inflammatory bowel disease within the United States. Gastroenterology 100: 143–149.
. 2006. Serum 25-hydroxyvitamin D levels and risk of multiple sclerosis. JAMA 296: 2832–2838.
. 2008. On the epidemiology of influenza. Virol. J. 5: 29.
. 2009. Association between serum 25-hydroxyvitamin D level and upper respiratory tract infection in the Third National Health and Nutrition Examination Survey. Arch. Intern. Med. 169: 384–390.
. 2004. Toll-like receptors: function and roles in lung disease. Am. J. Physiol. Lung Cell Mol. Physiol. 286: L887–L892.
. 2008. Differential recognition of double-stranded RNA by RIG-I‑like receptors in antiviral immunity. J. Exp. Med. 205: 1523–1527.
. 2007. Function of RIG-I-like receptors in antiviral innate immunity. J. Biol. Chem. 282: 15315–15318.
. 2008. Innate immune functions of the airway epithelium. Contrib. Microbiol. 15: 147–163.
. 2005. Type I interferons and the innate immune response—more than just antiviral cytokines. Mol. Immunol. 42: 869–877. 2007. Triggering the innate antiviral response through IRF-3 activation. J. Biol. Chem. 282: 15325–15329. 2001. Chemokines: immunology’s high impact factors. Nat. Immunol. 2: 95–101.
. 1996. “The good, the bad, and the ugly.” The role of chemokines in models of human disease. J. Immunol. 156: 3583–3586.
. 2007. 1,25-dihydroxyvitamin D3 reverses experimental autoimmune encephalomyelitis by inhibiting chemokine synthesis and monocyte trafficking. J. Neurosci. Res. 85: 2480–2490.
. 2004. A vitamin D analog down-regulates proinflammatory chemokine production by pancreatic islets inhibiting T cell recruitment and type 1 diabetes development. J. Immunol. 173: 2280–2287.
. 2005. 1,25-Dihydroxyvitamin D3 modulates expression of chemokines and cytokines in pancreatic islets: implications for prevention of diabetes in nonobese diabetic mice. Endocrinology 146: 1956–1964.
. 1997. IKK-1 and IKK-2: cytokine-activated IκB kinases essential for NF-κB activation. Science 278: 860–866.
. 2002. NF-κB regulation in the immune system. Nat. Rev. Immunol. 2: 725–734.
. 1997. The role of nuclear factor-κB in cytokine gene regulation. Am. J. Respir. Cell Mol. Biol. 17: 3–9.
. 2003. Direct transcriptional regulation of RelB by 1α,25-dihydroxyvitamin D3 and its analogs: physiologic and therapeutic implications for dendritic cell function. J. Biol. Chem. 278: 49378–49385.
. 2005. Regulation of relB in dendritic cells by means of modulated association of vitamin D receptor and histone deacetylase 3 with the promoter. Proc. Natl. Acad. Sci. USA 102: 16007–16012.
. 1998. Inhibition of IL-12 production by 1,25-dihydroxyvitamin D3. Involvement of NF-κB downregulation in transcriptional repression of the p40 gene. J. Clin. Invest. 101: 252–262.
. 1998. 1α,25-Dihydroxyvitamin D3 decreases DNA binding of nuclear factor-κB in human fibroblasts. FEBS Lett. 436: 329–334.
. 2006. Increased NF-κB activity in fibroblasts lacking the vitamin D receptor. Am. J. Physiol. Endocrinol. Metab. 291: E315–E322.
. 2004. 1α,25(OH)2D3 regulates NF-κB DNA binding activity in cultured normal human keratinocytes through an increase in IκBα expression. Arch. Dermatol. Res. 296: 195–202.
. 2009. 1,25-Dihydroxyvitamin D3 suppresses high glucose-induced angiotensinogen expression in kidney cells by blocking the NF-κB pathway. Am. J. Physiol. Renal Physiol. 296: F1212–F1218.
. 2002. Inflammatory response in airway epithelial cells isolated from patients with cystic fibrosis. Am. J. Respir. Crit. Care Med. 166: 1248–1256.
. 2009. Regulation of bacteria-induced intercellular adhesion molecule-1 by CCAAT/enhancer binding proteins. Am. J. Respir. Cell Mol. Biol. 40: 200–210.
. 2005. Haemophilus influenzae from patients with chronic obstructive pulmonary disease exacerbation induce more inflammation than colonizers. Am. J. Respir. Crit. Care Med. 172: 85–91.
. 2007. Retinoic acid-inducible gene I mediates early antiviral response and Toll-like receptor 3 expression in respiratory syncytial virus-infected airway epithelial cells. J. Virol. 81: 1401–1411.
. 2001. Involvement of Toll-like receptor 4 in innate immunity to respiratory syncytial virus. J. Virol. 75: 10730–10737.
. 2000. Pattern recognition receptors TLR4 and CD14 mediate response to respiratory syncytial virus. Nat. Immunol. 1: 398–401.
. 1989. The involvement of NF-κB in β-interferon gene regulation reveals its role as widely inducible mediator of signal transduction. Cell 57: 287–294.
. 1995. Activation of IFN-α, IFN-γ, MxA, and IFN regulatory factor 1 genes in influenza A virus-infected human peripheral blood mononuclear cells. J. Immunol. 154: 2764–2774.
. 2004. Respiratory syncytial virus‑induced chemokine production: linking viral replication to chemokine production in vitro and in vivo. J. Infect. Dis. 189: 1419–1430.
. 2005. Differential role for TLR3 in respiratory syncytial virus-induced chemokine expression. J. Virol. 79: 3350–3357.
. 2005. Human airway epithelial cells produce IP-10 (CXCL10) in vitro and in vivo upon rhinovirus infection. Am. J. Physiol. Lung Cell Mol. Physiol. 289: L85–L95.
. 1998. The proximal interferon-stimulated response elements are essential for interferon responsiveness: a promoter analysis of the antiviral MxA gene. J. Interferon Cytokine Res. 18: 773–781.
. 2007. Induction of MxA gene expression by influenza A virus requires type I or type III interferon signaling. J. Virol. 81: 7776–7785.
. 2004. ISG15: the immunological kin of ubiquitin. Semin. Cell Dev. Biol. 15: 237–246.
. 2003. IKKɛ and TBK1 are essential components of the IRF3 signaling pathway. Nat. Immunol. 4: 491–496.
. 2002. Temporal pattern of NFκB activation influences apoptotic cell fate in a stimuli-dependent fashion. J. Cell Sci. 115: 4843–4853.
. 1988. Cloning and expression of full-length cDNA encoding human vitamin D receptor. Proc. Natl. Acad. Sci. USA 85: 3294–3298.
. 1993. Retinoid X receptors stimulate and 9-cis retinoic acid inhibits 1,25-dihydroxyvitamin D3-activated expression of the rat osteocalcin gene. Mol. Cell. Biol. 13: 5907–5917.
. 2003. Vitamin D: more than a “bone-a-fide” hormone. Mol. Endocrinol. 17: 777–791.
. 2006. Respiratory syncytial virus induces TLR3 protein and protein kinase R, leading to increased double-stranded RNA responsiveness in airway epithelial cells. J. Immunol. 176: 1733–1740.
. 2004. Toll-like receptor signaling. Nat. Rev. Immunol. 4: 499–511.
. 2007. Airway epithelium controls lung inflammation and injury through the NF-κB pathway. J. Immunol. 178: 6504–6513.
. 2006. Lung epithelium as a sentinel and effector system in pneumonia—molecular mechanisms of pathogen recognition and signal transduction. Respir. Res. 7: 97.
. 2004. Innate immunity in the lung: how epithelial cells fight against respiratory pathogens. Eur. Respir. J. 23: 327–333. 2009. Nonclassic actions of vitamin D. J. Clin. Endocrinol. Metab. 94: 26–34.
. 2005. Human cathelicidin antimicrobial peptide (CAMP) gene is a direct target of the vitamin D receptor and is strongly up-regulated in myeloid cells by 1,25-dihydroxyvitamin D3. FASEB J. 19: 1067–1077.
. 2004. Cutting edge: 1,25-dihydroxyvitamin D3 is a direct inducer of antimicrobial peptide gene expression. J. Immunol. 173: 2909–2912.
. 2006. Vitamin D decreases NFκB activity by increasing IκBα levels. Nephrol. Dial. Transplant. 21: 889–897.
. 2007. Involvement of the vitamin D receptor in the regulation of NF-κB activity in fibroblasts. J. Steroid Biochem. Mol. Biol. 103: 563–566.
. 2008. Paricalcitol inhibits renal inflammation by promoting vitamin D receptor‑mediated sequestration of NF-κB signaling. J. Am. Soc. Nephrol. 19: 1741–1752.
. 1997. Airway epithelium as an effector of inflammation: molecular regulation of secondary mediators. Eur. Respir. J. 10: 2139–2146.
. 2001. Multiple cis regulatory elements control RANTES promoter activity in alveolar epithelial cells infected with respiratory syncytial virus. J. Virol. 75: 6428–6439.
. 1996. 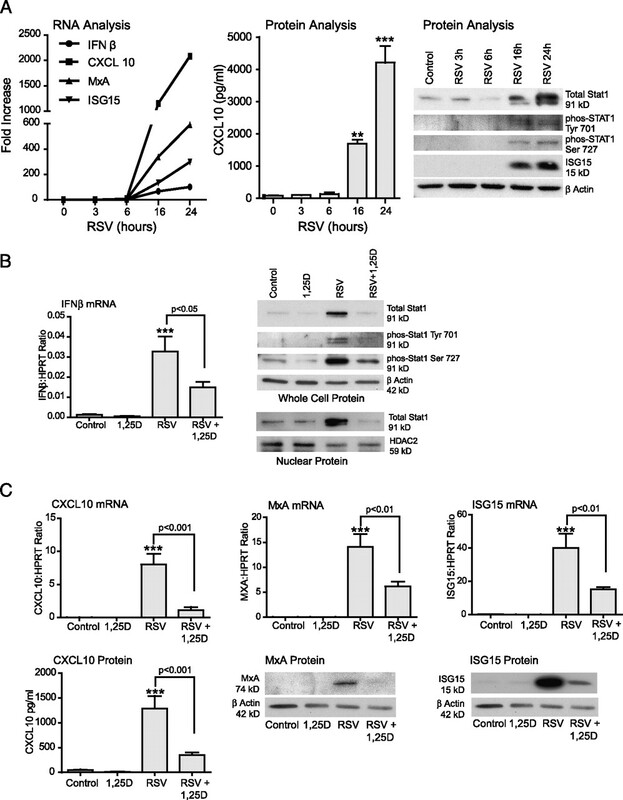 Transcriptional activation of the interleukin-8 gene by respiratory syncytial virus infection in alveolar epithelial cells: nuclear translocation of the RelA transcription factor as a mechanism producing airway mucosal inflammation. J. Virol. 70: 8773–8781.
. 1996. Induction of interleukin (IL)-8 gene expression by respiratory syncytial virus involves activation of nuclear factor (NF)-κB and NF‑IL-6. J. Infect. Dis. 174: 262–267.
. 1998. 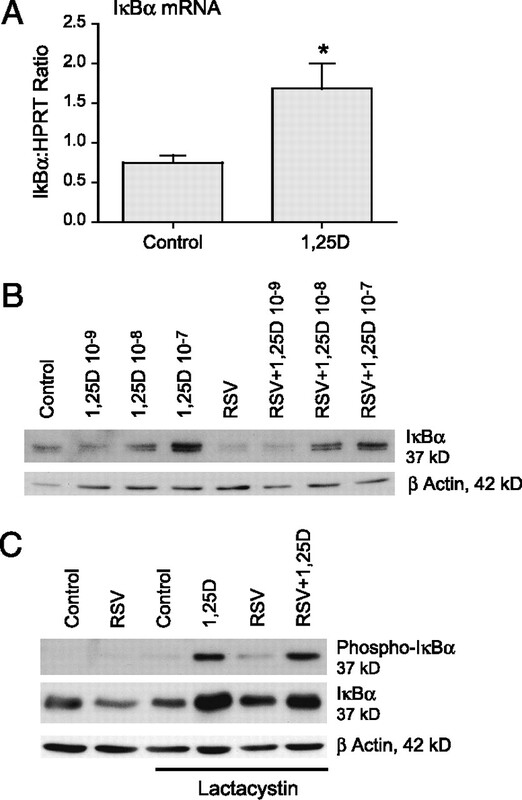 Respiratory syncytial virus-induced RANTES production from human bronchial epithelial cells is dependent on nuclear factor-κB nuclear binding and is inhibited by adenovirus-mediated expression of inhibitor of κBα. J. Immunol. 161: 1007–1016.
. 2002. Perflubron reduces lung inflammation in respiratory syncytial virus infection by inhibiting chemokine expression and nuclear factor‑κB activation. Am. J. Respir. Crit. Care Med. 165: 1433–1438.
. 2001. Cytokines and chemokines in respiratory secretion and severity of disease in infants with respiratory syncytial virus (RSV) infection. J. Clin. Virol. 21: 163–170.
. 1999. Peripheral blood cytokine responses and disease severity in respiratory syncytial virus bronchiolitis. Eur. Respir. J. 14: 144–149.
. 2001. Macrophage inflammatory protein-1α (not T helper type 2 cytokines) is associated with severe forms of respiratory syncytial virus bronchiolitis. J. Infect. Dis. 184: 393–399.
. 2000. Therapy for respiratory tract infections caused by respiratory syncytial virus. Eur. J. Pediatr. 159: 391–398.
. 2008. Role of human β-defensin-2 during tumor necrosis factor-α/NF-κB-mediated innate antiviral response against human respiratory syncytial virus. J. Biol. Chem. 283: 22417–22429.